CONGRATULATIONS to Teacher Carmen and husband Tony on the birth of their baby girl Riley Madison on the 28th March. CONGRATULATIONS to the Mpetshwa Family on the birth of their baby boy and brother to Ibavile. on the 31st March. We hope that Ibavile enjoys being a big sister to her brother. Grandparents special/person’s day was a huge success. Thank you to the very special people who took time out of their busy lives to be with their children. I would also like to thank the class moms for offering their assistance in making the day run smoothly. Please note that the school will be closed over Easter on Friday 14 and Monday 17th March, as well as the 24th, 25th, 26th and 28th April (27 April and 1 May are public holidays). This is to give the teachers a well deserved break. We will open again on Tuesday 2 May. The mornings are getting cooler but by midday it is quite warm, so we suggest that you dress your child in layers of clothing so we can peel off or put back on as the day gets cooler. It is advisable that during the winter months the children's vitamin intake be increased especially vitamin C. This has been recommended by many nutritional specialists to help prevent illness. For extra warmth during your child's sleep time you are welcome to bring a blanket and a pillow to school labelled with the child's name. The blankets will then be sent home every Friday so that they can be washed and returned on Monday again. On Thursday 13th April the Easter Bunny will be visiting the school. The Easter Bunny will be hiding Easter eggs for the children to find. We will be celebrating earth day on Friday 21st April, by making an “Earth Craft Flag” with recycled paper which will be done with the children. The aim of Earth Day is to bring awareness of our fragile planet, and how we can all do our little part in taking care of it. 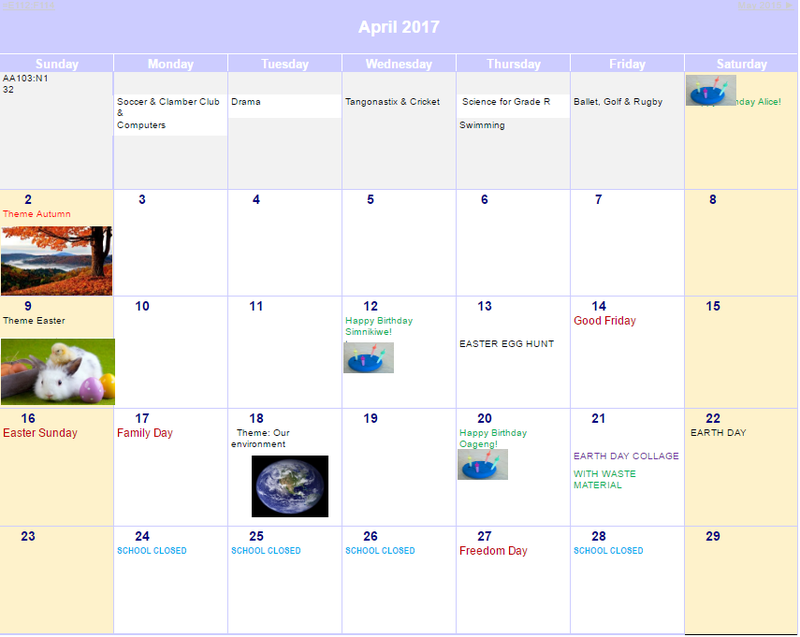 Please see the Earth-day website for more information. Another way to help our environment is if parents could please donate waste or scrap paper for the children to use (we go through so much paper) the paper can be printed on one side only so we can use the reverse side for the children to draw and colour. If anyone still has the old fashioned serrated continuous printer fed paper, this will be highly appreciated. Please keep Saturday 20 May open for our annual Sports Day. More information will follow in May. Did you know that our school becomes childrens party venue on weekends? and as a parent of the school you get 15% off the venue hire even if its for the child of a relative or friend? For more informations check out the party venue website.